Lone Star Clash is a deeply Texan gaming event – one which crowns its winners with cowboy hats and fills its quiet moments with chicken wing eating contests. Started up in 2011 by a group of Austin students, the Clash has since become known for its decidedly non-amateur production values and prize pool. This summer, it promises a piece of $35,000 for top players in League of Legends and StarCraft 2 – including first invitee Choi ‘Polt’ Hun. Over the weekend beginning May 3, the North Austin Events Center will host three tournaments: a StarCraft 2 invitational worth 1800 WCS points, a League of Legends challenger invitational, and the IvyLoL Season 3 finals. The Starcraft 2 invitational and League of Legends challenger event will each boast a $15,000 prize pool – with the remaining $5000 reserved for IvyLoL. 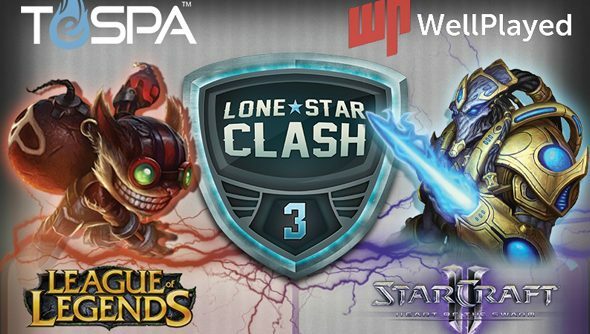 “With Lone Star Clash 3 we hope to take the production quality WellPlayed is known for and finally bring it to a live event,” WellPlayed CEO Colin Kierans told onGamers. Ah, yes: though WellPlayed are supported by US university eSports association TeSPA – who have their own deal with Blizzard – they’re hoping to crowdfund the remaining $40,000. If raised, that’ll go towards venue costs, equipment, production improvements, and player travel and accommodation. What it won’t fund is that mammoth prize pool, the pay of TeSPA and WellPlayed, or the fees of the show’s casters – who include Team Digitas veteran William ‘scarra’ Li and Optimus Tom. That’s already paid for. If the Indiegogo campaign fails to muster enough monetary enthusiasm, the Clash will go on – but WellPlayed will need to limit its scope somewhat. Do you think you’ll help them fulfil their admirable ambition?